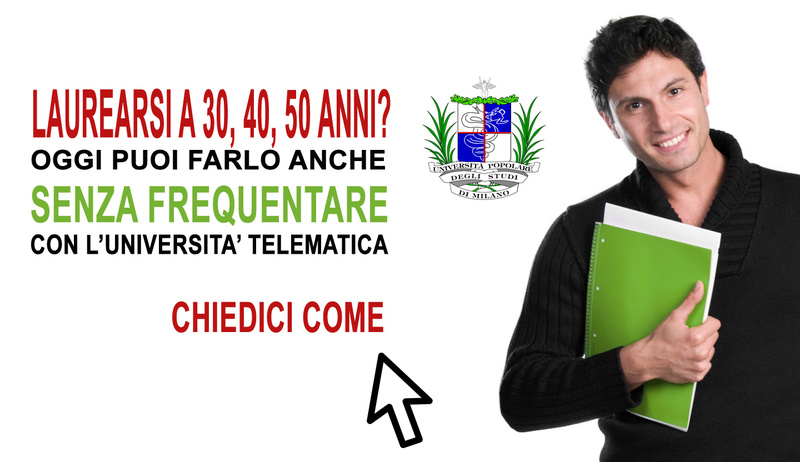 Dark cloak, slim figure, he looks more like an actor than an Academic. And not by chance, as his passion for theatre played a crucial role in his career. However, as soon as we start talking together, his competence and enthusiasm reveal the perfect combination of both areas. 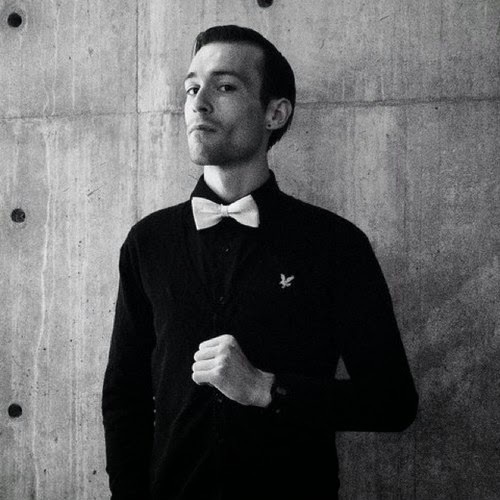 I am talking about Dr Samuel Illingworth, lecturer in Science Communication at Manchester Metropolitan University. Dr Illingworth finished his PhD in Atmospheric Physics in 2010 at the University of Leicester. He then moved to Japan, where he started studying how theatrical techniques could be used in Science Communication in order to deliver the message effectively. Back to the UK in 2012, he spent 18 months at the University of Manchester where, in addition to measuring methane and other greenhouse gases from airborne platforms, he started developing several outreach activities throughout the Greater Manchester area, before taking up his current position at MMU. In the interview proposed here, Dr Illingworth covers all the questions related to the current situation of Science Communication in Britain. He also shares his own experience and opinions about the field. What's the situation of science communication and science journalism in the UK today, and how do you see this changing in the future? I think that Science Communication in this country is in a fairly healthy state. We have succeeded in moving almost entirely away from a one-way deficit approach, and genuinely seem to be engaging with the general public in two-way dialogue that is ultimately influencing science policy and research. With the advent of social media, science journalism is also enjoying something of a swansong, and it is important that journalists and scientists alike continue to embrace these changes in order to communicate in the most effective way possible. In the future I see science communication becoming even more important, and not only because a consideration of social ‘impact’ is to become a prerequisite for all government funded scientific research. We finally seem to be waking up to the idea that we can no longer tell people what science is important to them, and I look forward to opening up this conversation even further. With genuinely mind-blowing scientific news stories appearing in the media on an almost daily basis, it seems that the stories that can be reported upon are restricted only the limits of human endeavour. However, it is important to realise that as with scientists, journalists have a responsibility to report the science that will have the greatest impact on society, and to do so in such a way that avoids scaremongering or a politicised agenda. Scientists and general journalists: who is currently acting the main role in science communication in Britain? 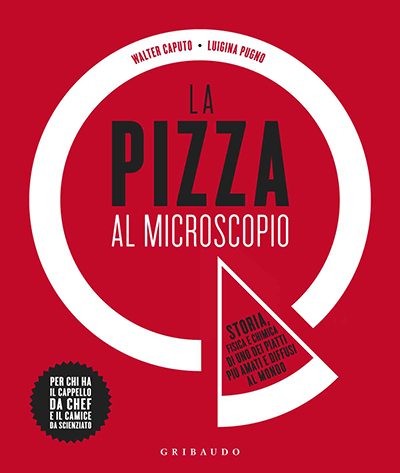 As well as eloquent scientists such as Brian Cox and Robert Winston, there are also exceptionally gifted science communicators such as Ed Yong and Alice Bell, who write about important science in an effective and accessible manner. We are also blessed with some honest and gifted scientific journalists such as Jonathan Amos and Steve Connor. The popularisation of blogs has meant that many scientists can communicate their own research either prior to or proceeding publication. It also means that the general public have a variety of sources from which to choose their science news. Organisations such as the WellcomeTrust also have dedicated public engagement strategies that help to ensure that the public are kept up to date with research. Similarly, funding bodies such as the National Environmental Research Council (NERC) work hard to make sure that their research is being effectively communicated using a wide range of media. What's the current British public attitude towards science? 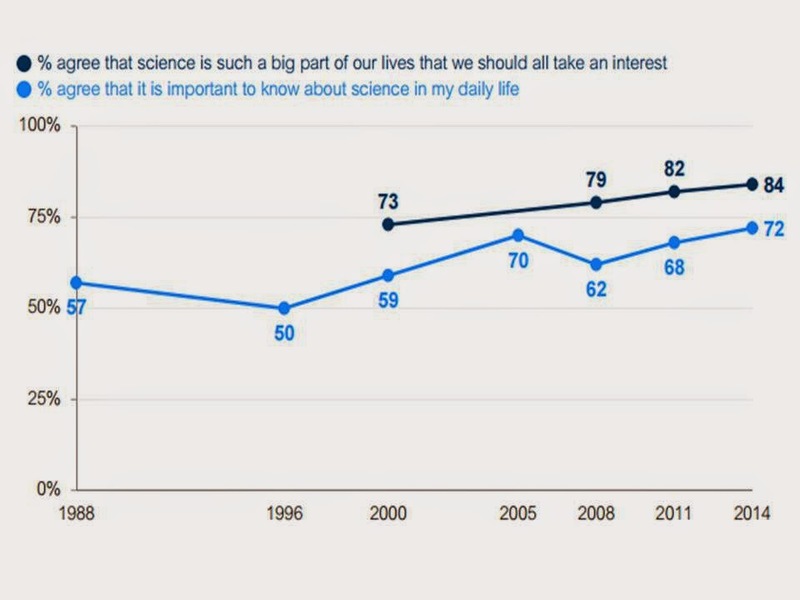 According to the recent Public Attitude to Science 2014 report, 72 % of the general public agree that it is important to know about science in their daily lives. 90 % of them also think that scientists make a valuable contribution to society. 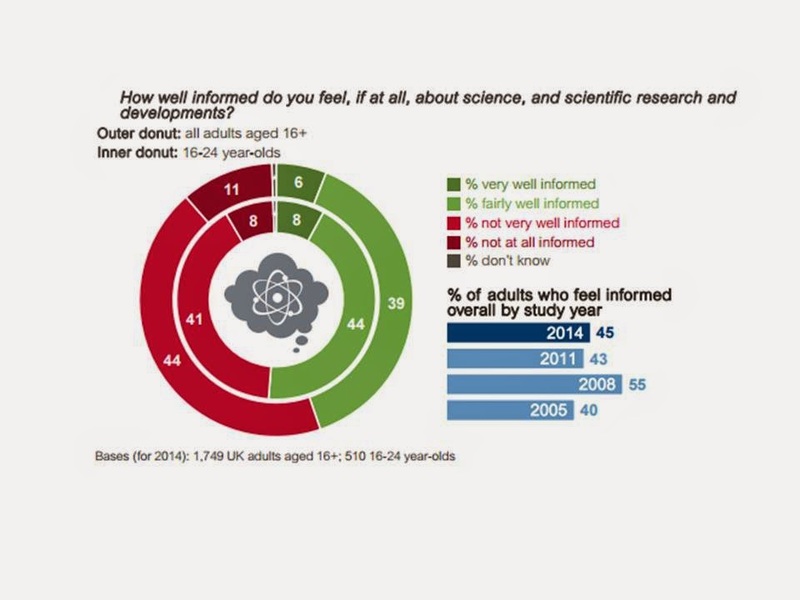 However, 51 % of the general public think that they could hear more about science, whilst 69 % of them think that scientists should listen more to the general public. I am hopeful that this will change in the proceeding years as scientists work closer with the general public to find out exactly what it is that they want to find out more about. 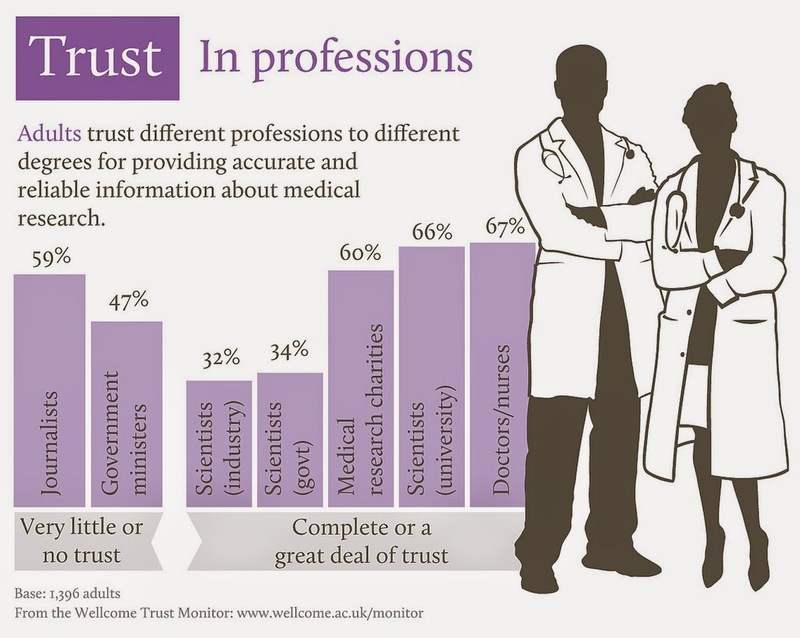 The Wellcome Trust Monitor found that only 33% of people had a complete or great deal of trust in scientists, and that 59% of the general populous had very little or no trust in journalists. In a way these statistics are not quite as damning as they first appear, as it would be dangerous if the general public took everything that science said at face value. However, these figures could and should still be improved upon, and one of the ways that we can do this is by helping to make the whole scientific process more transparent, and by soliciting opinion and advice from the general public. 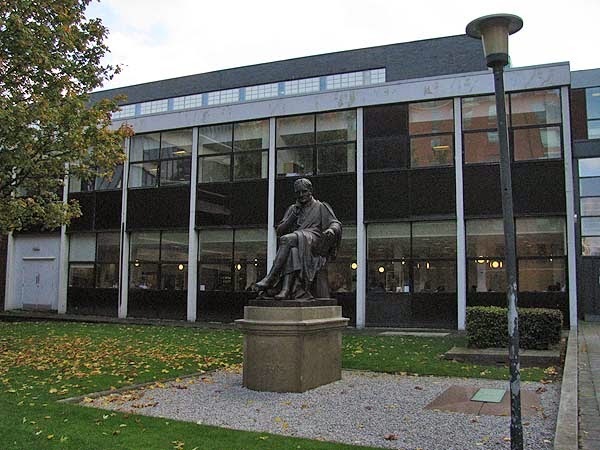 You are currently a lecturer in Science Communication at Manchester Metropolitan University (MMU); what first brought you into this field? During my postgraduate studies I was the president of the University of Leicester’s Theatre Society (LUTheatre), and I developed a number of educational activities that used theatre to explore scientific themes. One of my most lasting memories is of demonstrating the water cycle via musical theatre! A personal hero of mine has always been CP Snow, a respected scientist and author, who proposed that the only way for many of the world’s most complicated problems to be solved was for scientists and artists to work together in interdisciplinary collaborations. Snow also studied at Leicester, where he too was involved in their theatre society. Following my PhD I spent two years living and working in Japan, as part of a scholarship provided by the Daiwa-Anglo Japanese Foundation. In Japan I worked with the great Japanese director Yukio Ninagawa. I also lectured at the Tokyo Institute of technology, teaching young scientists how to be more effective communicators by harnessing theatrical technique. 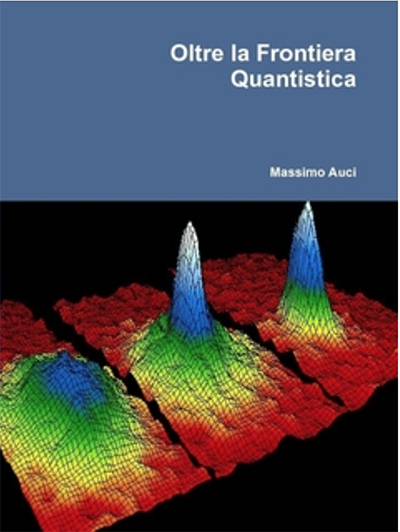 Since moving back to the UK I have been fortunate enough to be able to continue this area of research, which has lead to my lectureship at MMU. Which kind of activities are you currently involved for outreach and public engagement in Manchester or elsewhere? I am involved with a lot of different outreach and public engagement events in Manchester and across the UK. 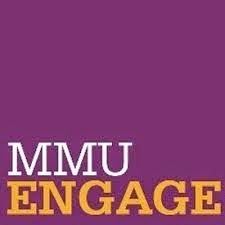 Some of these events can be found here at the MMU Engage website. As well as events that I help organise to raise awareness of science and to promote two-way dialogues, I am also conducting numerous studies into how theatre can be used to communicate research. One of my other main passions in life is writing poetry, and as well as regularly writing scientifically themed poems on my blog, I am also interested in the symbiosis between the two. 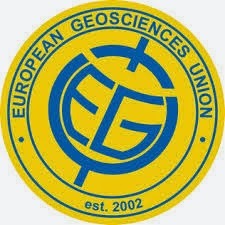 I am very proud to be the Young Scientist Programme Committee representative for the Euro Geosciences Union (EGU), where I work hard to promote the importance of science communication and science education within the field of geosciences and beyond. I am also a keen Tweeter (@samillingworth), and am always happy to talk about anything vaguely science or poetry related! In your opinion, what is the potential of scientists for communicating science? Having worked with a number of scientists in developing their communication skills, I think that it is a misnomer that scientists are poor communicators. Some of the best communicators that I know are scientists, and I think that with the right encouragement we can work even more effectively to engage the general public in genuine two-way dialogues. In order for science communication to be properly recognised as a necessary and effective skillset it needs to be better recognised by research institutes as a valuable commodity. I have written about this in a recent publication, but actually there needs to be recognition for the excellent work that many scientists are already doing to ensure that science is being effectively communicated.